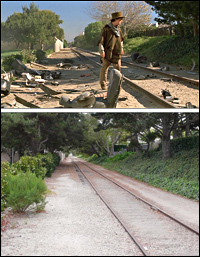 Fans Richard & Carol Barnes happened to find themselves in Malibu recently, and decided to drive a little farther up the coast to shoot photos of the actual railroad tracks where they filmed that final B.T.T.F. scene, and was cool enough to share them with us. 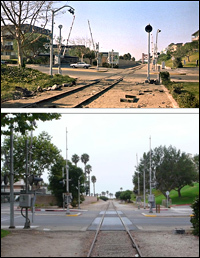 Below, you'll find a series of comparison shots, featuring screencaps from the movie, matched to the location photos Richard shot. Click on the small photos below to see much larger versions! Bear in mind that the bridge seen in the distance (in the movie caps) is fake - there is no actual bridge here, just the railroad crossing. Some of the signs are also fake. But everything else is real, including the track, the railroad signals, and the buildings seen in the background. 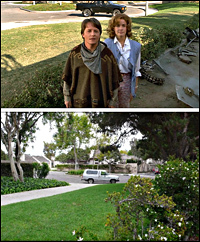 "Back to the Future III" was filmed in 1990, and Richard shot these comparison photos in 2009, almost 20 years later, so it's not surprising that quite a few things have changed over time (especially the trees, which have grown a lot). Marty & Doc are stuck back in time again, this time in the Old West of 1885, and trying to find a way back to the present. Their time-traveling Delorean is out of gas and they need a way to get it up to 88 miles per hour for it to make the jump through time. Doc decides that the only way to do this is to push the car with a steam-powered locomotive, using special logs to make it go faster. But as usual, there's a hitch. The only stretch of train track where they can get the locomotive up to that speed ends at a washed out bridge, where the locomotive would tumble into a canyon. 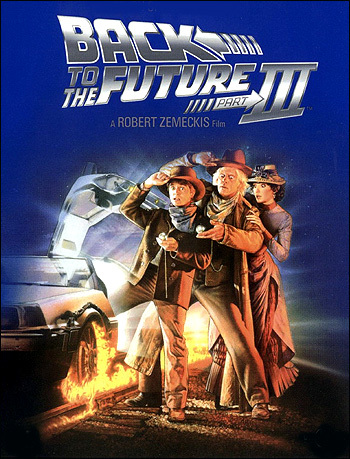 This doesn't stop Doc, though, who realizes that if they can get the Delorean up to 88 mph a split-second before they reach the canyon, the car will make the leap into the future, where a modern bridge awaits to keep the passengers safe. So, in this scene, pictured below, we see the time-traveling Delorean arrive back in the present (just after the locomotive has plunged to a fiery death into the canyon). Marty is safe inside the car. But seconds later, a modern train roars down the track (in the opposite direction), smashes into the car, and destroys the Delorean once and for all (as Marty leaps to safety). It would seem that Doc (who stayed behind, to rescue a woman he met there) is permanently stuck in the past. But as Marty is looking at the debris from his wrecked Delorean (strewn all over the tracks), Doc suddenly reappears, piloting a time-traveling steam locomotive he has built, and introduces Marty to his new wife & children. 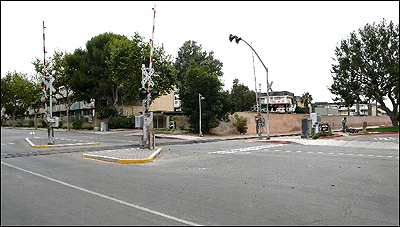 So, just where IS that famous railroad crossing?? You'll find it at 270 S. Ventura Road, in Port Hueneme, CA. That's just a block north of the beach (between Seaview Street & Surfside Drive). 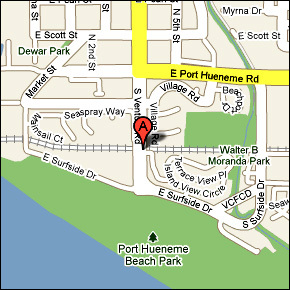 To which many people are no doubt shouting, in unison: "Where the hell is Port Hueneme ?!" Not surprisingly, it's on the coast, about 30 miles northwest of Malibu, just north of Point Mugu, and about 3 miles south of Oxnard. It's a good hour's drive (about 65 miles) from downtown L.A. 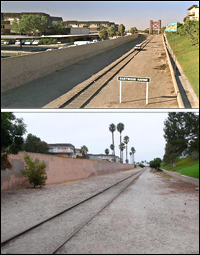 The train tracks seen in the film run east/west, and the street that crosses the tracks (Ventura Road) runs north/south. In the scene, the Delorean is heading east down the tracks. It is hit by a modern locomotive heading west on those same tracks. The tracks are actually just a short spur leading away from the main tracks (that carry Amtrack trains from L.A. to Santa Barbara) to a Naval Storage Yard three blocks away from the crossing. In short, those tracks don't really go anywhere. Richard reports that the rails are all rusty from non-use, and that they probably haven't seen use in years - which helps explain why people would live in apartments right next to these tracks. Here is an aerial photo of the area, looking west up the tracks. Here is a good Google StreetView of the railroad crossing.